“What can I do?” It’s the right question—almost. A fossil-fuel-free community empowers its members to dramatically reduce their dependence on the corporate economy. Committed communitarians cut their carbon emissions to around 10 percent of the American average. As a climate solutions advocate explains, carbon is not a bad thing; it’s just in the wrong places right now. For the next generation, planting trees, growing food, and living in community are only the start. 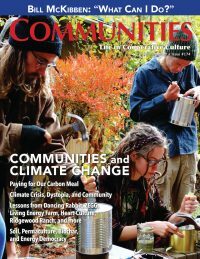 Community-led action, with permaculture as a key tool, is the basis for many of the most innovative and effective responses to climate change. Numerous projects on a community’s 5,000 acres contribute to climate-adaptive land stewardship. Three innovative non-residential groups use community as a tool to address climate change. A community in Fiji responds to a category one hurricane—a taste of events yet to come. Compared to carbon offsetting, carbon onsetting may be a more effective strategy to build sustainability. In Community Choice Energy agencies, we are witnessing the emergence of Energy Democracy. Life in an ecovillage demonstrates that less can be more. Cooperative culture helps us evolve beyond the nuclear family toward conscious kinship and reconnection with the land. Deteriorating social and environmental conditions require both spiritual preparation and practical steps. How do we strengthen communities as climate change intensifies? A replicable ecovillage model is our best hope for achieving essential, global-scale changes. A book on “life beyond industrial civilisation” inspires the creation of an ecovillage. The situation may appear hopeless, but what we do together can transform the world. From the personal to the global, with hard times undeniable, community may be our life-support. A new book offers grassroots strategies for responding to climate change. ← Event season begins with Cohousing and The Farm!